Treaty with Russia on Azov: How Should Ukraine Act? 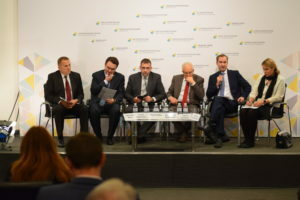 – Центр "Нова Європа"
Home - Events - Treaty with Russia on Azov: How Should Ukraine Act? Treaty with Russia on Azov: How Should Ukraine Act? Kyiv should comprehensively explore the issue of denunciation of the Agreement between the Russian Federation and the Ukraine on cooperation in the use of the sea of Azov and the strait of Kerch since 2003, but on the whole this agreement does not correspond to Ukrainian interests. 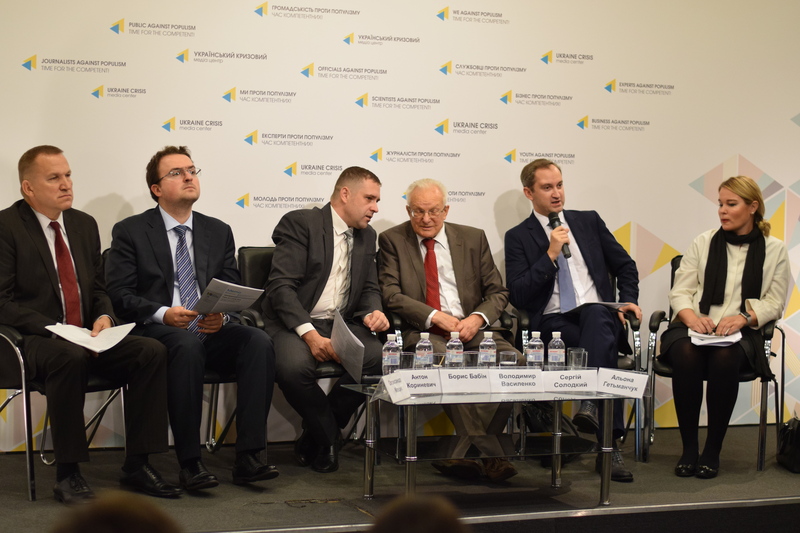 This was discussed during a public discussion «PRO et CONTRA: Should Ukraine denounce the Azov Agreement?» that was organized by the New Europe Center on October 3. 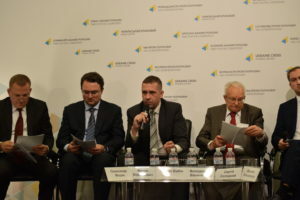 The speakers include Sergiy Solodkyy, First Deputy Director of the New Europe Center; Olexandr Motsyk, Ambassador Extraordinary and Plenipotentiary of Ukraine; Borys Babin, Permanent Representative of the President of Ukraine in the Autonomous Republic of Crimea; Volodymyr Vasylenko, Doctor of Law, Ambassador Extraordinary and Plenipotentiary of Ukraine; Anton Korynevych, Ph.D., Kyiv National Taras Shevchenko University, Institute of International Relations. Alyona Getmanchuk, Director of the New Europe Center, moderated the discussion. «Unfortunately, we still do not see clear position of Ukraine on the future of the Agreement with Russia on Azov. There are 11 arguments for denunciation of this agreement and 10 against it in our memo. The arguments are not equivalent in themselves, because the arguments presented in terms of protecting the security and sovereignty of our state should dominate. We cannot afford to be in a situation where we have one more naked front», – noted Director of the NEC. «Today is the feeling that we are in a dual trap: The Azov Agreement and the Treaty on the Ukrainian-Russian state border, to which it is tied in one way or another. 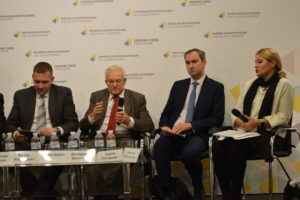 There is a big challenge if we would decide to denounce the Azov Agreement, because in this case we must be ready to answer what to do with the Treaty on the state border», – Alyona Getmanchuk added. 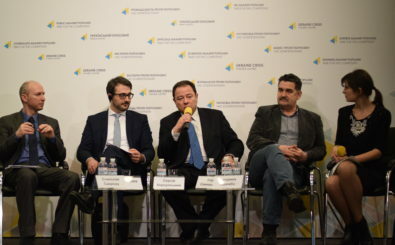 At the beginning of the event Sergiy Solodkyy presented a memo with arguments “Pro” and “Contra” the denunciation of the Azov Agreement with Russia. 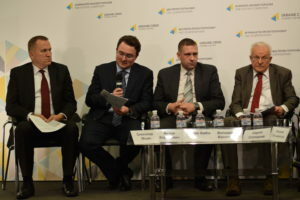 «The basic argument for the denunciation of the Azov Agreement is that this document significantly narrows the rights of Ukraine, because it was signed under pressure from Russia», – said First Deputy Director of the NEC. «This issue is very serious, it needs to be explored from all sides. Under the National Security and Defense Council of Ukraine an expert group should be set up, which would include experts on maritime law, as well as those who negotiated the Agreement. Ukraine could adopt the Territorial Sea Law, which would be based on the United Nations Convention on the Law of the Sea, because Russia, like Ukraine, is a party to this convention, so it would be hard for Moscow to deny such an action of Kyiv». 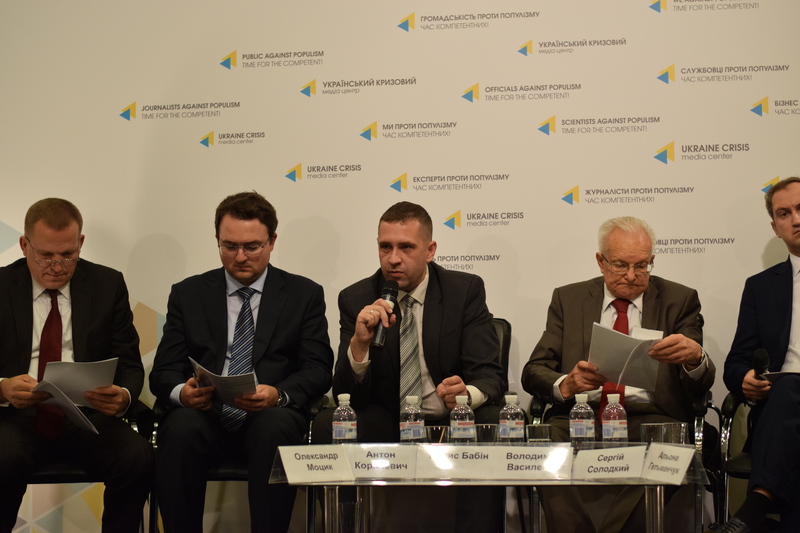 Borys Babin, for his part, noted that the main policy of Ukraine in the Sea of Azov should be to enhance security capabilities. 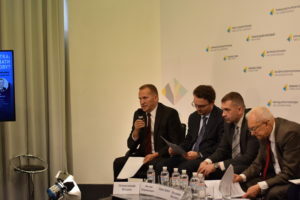 He also stressed that the situation in the Sea of Azov has not only a political dimension: « There is a powerful fishing lobby that is interested in maintaining the current status quo in the Sea of Azov». Volodymyr Vasylenko said that denunciation by Ukraine of the Azov Agreement with Russia would not weaken Kyiv’s position in the International Tribunal for the Law of the Sea. «Russia sabotaged negotiations on delimitation of the border in the Sea of Azov. Ukraine can take advantage of this fact and break the Agreement with the Russia on Azov in accordance with the provisions of the The Vienna Convention on the Law of Treaties», – noted Vasylenko. Anton Korynevych said that the issue of the denunciation of the Azov Agreement goes beyond the legal sphere, and requires the involvement of security specialists, the Navy, as well as all the government bodies whose activities are related to the Sea of Azov. «We often talk about comparing the so-called Treaty of Friendship with Russia and this Azov Agreement. These are different issues. The decision not to renew a political agreement is logical, but the Azov Agreement is more technical. Therefore, I am not convinced that the denunciation of the treaty will solve our problems», – Korynevych added.